The Mass Effect Trilogy will include DLC, but the details vary a bit from system to system. The biggest question to follow in the wake of last week's announcement of the Mass Effect Trilogy seemed to be, "Will it include DLC?" Sixty bucks isn't much of a deal, after all, if you end up forking over extra cash for Zaeed or Pinnacle Station. But the situation has been clarified and the news is good: DLC is part of the package. Not all the DLC, however, and what you get depends on what you have. The PC version of the Mass Effect Trilogy will include Bring Down the Sky and Pinnacle Station for Mass Effect, the Cerberus Network for Mass Effect 2 which includes the Zaeed Massani DLC The Price of Revenge, the Firewalker Pack, Cerberus Assault Gear, the Arc Projector heavy weapon and the Normandy Crash Site mission, and the Online Pass for Mass Effect 3 which grants access to multiplayer. The Xbox 360 version of the Trilogy is very similar, but instead of being on the disc, Bring Down the Sky and Pinnacle Station will be available as "stand-alone downloads" from Xbox Live, while details on the PlayStation 3 version of the package will be revealed "soon." EA also confirmed the Trilogy is fully compatible with previous releases of the games, so saved games from the original releases will work with it and you can get your multiplayer on with the rest of the world. The clarity isn't perfectly crystalline because it fails to state definitively whether Xbox 360 owners will have to pony up for the "stand-alone downloads" or if they'll be given codes for free downloads. We've put the question out to those who might hold the answer and if we hear back, we'll let you know. 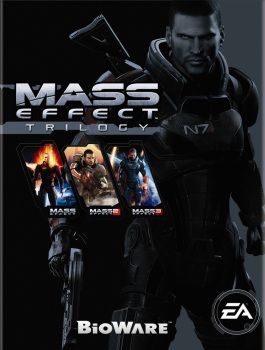 The Mass Effect Trilogy comes out on November 6.